Plant height: 8 - 20"
Flower: 3/4" Pink, with a fringed lip that has a yellow center. Its fragrance has been likened to that of raspberries. Flowering time: Flowers June, usually around the end of Arethusa bulbosa's bloom. The second of our three "pink" orchids.Insect pollinated. 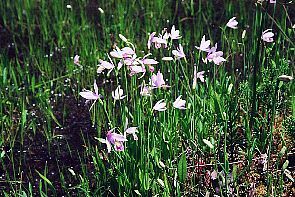 Habitat: Open acid soil of wet meadows or sphagnum bogs. 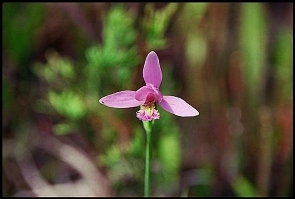 Often found with Arethusa and Grass Pink (Calopogon) orchids. Misc. 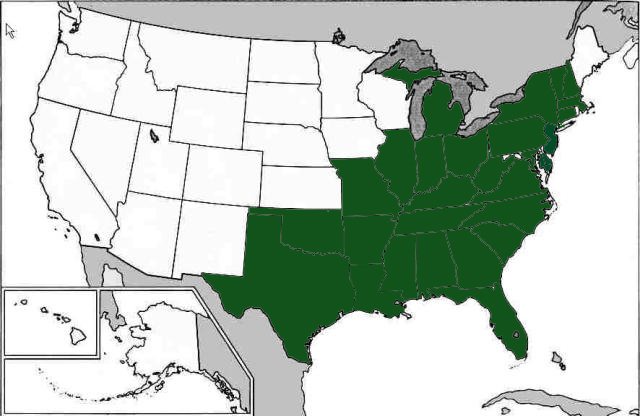 USDA notes an obligate wetland species: Occurs almost always (estimated probability 99%) under natural conditions in wetlands. In literature, both Thoreau and Frost were quite impressed with this orchid. 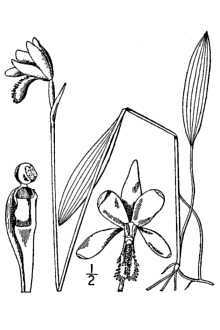 In 1852 Henry David Thoreau wrote of the snakemouth orchid: "the adder's-tongue arethusa smell exactly like a snake. How singular that in nature, too, beauty and offensiveness should be thus combined. In flower, as well as in men, we demand a beauty pure and fragrant, which perfumes the air. The flower which is showy but has no, or an offensive odor expresses the character of too many mortals." Robert Frost, as a child, once came upon a small wet clearing in the woods. He later recounted it in "Rose Pogonias". While so confused with flowers.